What are the benefits of installing a louvered roof? Sun, shade, and shelter. Complete control over your outdoor environment. 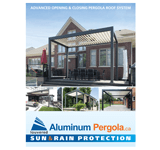 Aluminum Pergola will help you maximize the use of your outdoor space. You can have shade at the touch of a button while still being able to let the sunshine in when it is preferred. With the built in gutter system, you have shelter from the rain as well. Our system is powder coated, extruded aluminum with stainless steel components giving us the most durable louvered roof. From our superior drive system, down to the stainless steel tex screws that secure the system together. Nothing but the best! Our system is the most durable louvered roof on the market today in Canada! It has been specifically engineered to withstand hurricane force winds, heavy snow loads, and everything in between. Yes, our system can be attached to an existing structure or erected as a standalone unit! The Pergola features one standard color beige in combination with bronze, which is compliment almost any architecture. A chemical textured powder coat makes a more scratch resistant surface while giving it a flatter finish that is driving the outdoor color pallet of today.